Here’s what we recommend that you do to get the most reliable performance from solar lights with these handy features. If your solar light or solar water feature has adjustable panels, they should be repositioned seasonally. Not only does the position of the strongest sun each day change season to season (and sometimes month to month), you also need to factor in changes in shadows. Shadows from buildings and fences will move throughout the season, just like they are different in the morning than in the afternoon. In addition, you need to factor in foliage (or lack of foliage) on trees. 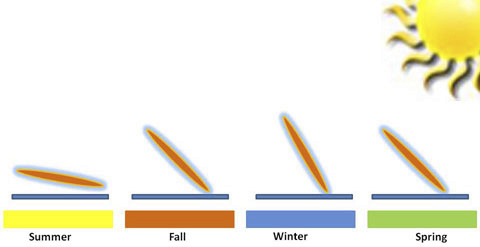 With this in mind, the following diagram shows how solar panels should be adjusted seasonally. Regardless of the angle, remember to make sure that the solar panel faces the direction where it gets the most sun. In some areas of your property, this will be in the morning; in other areas, it will be in the afternoon. Depending on where you live, mid-April means you have may full foliage, no foliage, or your trees are somewhere in between. The stronger your sunshine will be at any time of the year, so often a 4 hour solar charge in Southern California or Florida gives the fixture about the same amount of solar energy as a 6 hour charge in Minnesota or Vermont. Overall, it balances out. Always remember when placing new solar lights is that you really need to watch sun and shade patterns around your property. This is especially true for lights that aren’t easily moved such as solar lamps and solar flood or spotlights. If your solar lighting doesn’t have adjustable panels, such as many accent lights, the good news is that these are very easy to move. And many people find that while solar lamps or security lights need to be in certain places for safety, they like to move accent lights throughout the season. For example, we move some solar spotlights to focus on perennials that are in bloom. 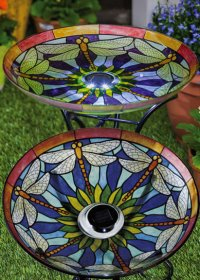 And when the blooms fade, we add accent or decorative solar lights, birdbaths, or small fountains lights to add some color and interest. We’ve said this before, but it’s worth repeating: it isn’t your imagination that security lights often light up more frequently when it’s cold than when it’s warm. This is because modern motion detectors aren’t actually activated by “motion” itself. Instead, they detect the warmth of the person or animal that passes through the PIR sensors field of vision. So, given than humans’ average body temperature is 98.6 degrees and thereabout for most mammals, the PIR sensor does turn on more frequently on the basic setting when during colder weather, and less often during warmer weather. That’s why better, and usually more expensive security lights have three adjustable settings. Most of our PIR lights can be adjusted easily and with winter temperatures here, it’s a good time to change certain settings. As long as you can safely access the floodlight or spotlight, it’s pretty easy to do. (For example: whenever using a ladder, make sure the ground is stable enough. This can be tricky in spring when ground is often softer than normal due to rain or if it’s thawed out after winter. Most motion-activated spotlights and floodlights have 3 settings, shown in the picture below. The TIME button lets you set how long the light will stay on each time it’s activated, usually from around 15 seconds to a minute. Since most solar lights have more “reserve power” in spring through fall than during the winter, you probably will be able to adjust the time so the lights stay on longer without having the solar energy in the rechargeable batteries used up by morning. The LUX button lets you set how dark you want it to be when the sensor begins to work. While there always has to be some darkness, you usually can set it to start detecting motion at dusk or wait until it’s pitch dark out. How you use this setting depends on the type of security you need: tripping hazards, dangerous locations, etc. Again: remember that now that the days longer than nights, you can adjust this to turn on earlier and usually better quality lights will function to daybreak. The SENS button lets you decide how much motion. Just as in when it’s cold you want to turn the sensitivity down, now that it’s warming up you need to turn the sensitivity up.When the hot summer weather comes, it’s a good idea to set the SENS to be most sensitive, especially if your area regularly gets temperatures in the 90s.One more thing: anytime you think that your PIR detector isn’t working the way you need, this is a very easy fix as long as you can reach the solar light safely. If you have questions about any of the above, please feel free to email us at Info@SolarFlairLighting.com. Copyright 2014, SolarLightingSmart.com, Get Smart About Solar Lights; SolarFlairLighting.com: Smart Solutions for Solar Lighting and More. All Rights Reserved. 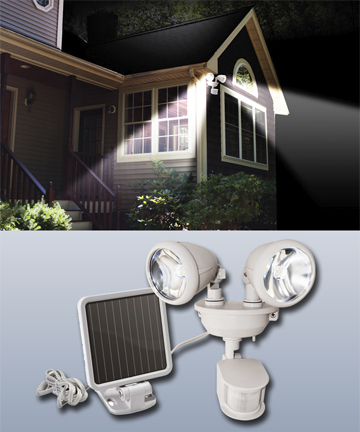 This entry was posted in Seasonal, Selecting & Caring for Solar Products, What's New and tagged adjust solar security lights for spring, seasonal adjustments for solar lights, solar lamps, solar lights, solar security lights, spring tips for solar lights by SolarLightingSmart. Bookmark the permalink.